A Sikh society set-up in memory of Baba Sohan Singh, the revered granthi-parcharak from Malacca, plans to hire three full-time Sikh teachers to serve nationwide. 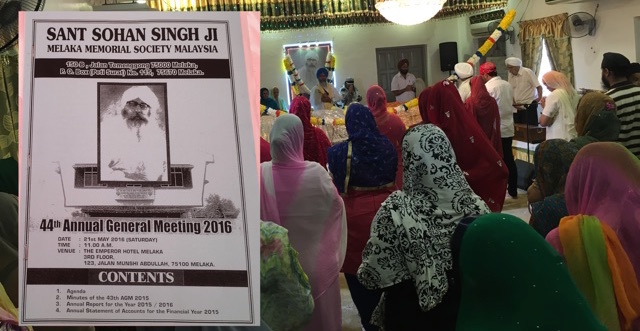 At its annual general meeting today (21 May 2016), the Sant Baba Sohan Singh Ji Melaka Memorial Society Vidyala (Vidyala) has approved a budget for the purpose. The task falls under the society’s Gurmat Studies programme initiaited in 2008. The study is a distance learning programme based on the two-year correspondence course produced by the Ludhiana-based Sikh Missionary College. Sixty two students received Diploma in Gurmat Studies at its first convocation in November 2012 in Petaling Jaya. The next convocation, involving some 100 students, is scheduled on 2 Oct 2016 at Petaling Jaya. The three teachers to be hired will conduct Sikhi Learning Circles where they will meet face-to-face with existing and news study of the study circle on a weekly basis. They will assigned to specific regions, with plans to have three regions for a start, according to the internal discussions. At the AGM, Amerpal Singh was re-elected to serve another two-year term as president. He will appoint a new committee for 2016/18. The outgoing committee consisted of four vice presidents (Baldev Singh Randhawa, Bhag Singh Sandhu, Sukhinderjit Singh Muker) and Reshminder Singh. The honorary secretary was Darshan Singh Sandhu while the honorary treasuere was Lakhbir Singh Bhar. The figure currently is in thousands/lakhs of RM individually and in millions CUMULATIVELY in Malaysia alone. I would like to see a similar high level gathering to assist needy students to furthef their studies to become all they dream and want to be and also assist families needing health or financial assistance directly and indirectly. Hundreds of RM are being approved and spent on religoun related functions but little is known about programmes to assist the needy.